I love the movie Nanny McPhee. She becomes a nanny to a family with very naughty children and teaches them to “behave”. My girls love it when I say “behave” in my silly British Nanny McPhee accent. I decided to write this post because this summer I have been noticing some bad manners in my house and I wanted to fix them ASAP. Just tonight I took my children out to dinner and all three of them were smacking their mouths while eating their food. I also remember a time when the girls were so wild we couldn’t even go to a restaurant. Take out never tasted so good. I took a poll and asked about 15 of my friends and family members what manners they thought every child should know. Disclaimer: I know kids will be kids and it’s okay to let them be kids. But it is also important to remember that good manners are essential for every child’s self confidence and success in life. In my little poll this was the most important manner by far. My parents gave me a book with this title about 10 years ago for a house warming gift and I love it. Sometimes I have to remind my kids to say please and thank you. But it makes my day when I don’t have to remind them, and my friends tell me later my girls gave them a big hug and thanked them for the delicious dinner. Please and thank you are magic words. Say ‘excuse me’, even if it is an accident. My kids always bump into each and get mad. I try to tell them if they say ‘excuse me’ or ‘sorry’ right away, then it won’t elevate into something bigger. I got this flip book for my daughters and they love to read it. My girls have a burping and tooting problem but somehow when they say ‘excuse me’ it makes me feel a little better. This picture is perfect for introducing #3. Last week my children told me that my mom cooks better than me. I was seriously annoyed because I actually love to cook and think I am pretty good. They then told me I am a good cook and I learned from the best. I am going to take it as a compliment. But they had better NEVER say that when we are eating at another house. I remember when Vera was 4 years old and my friend made this gooey brownie ice cream dessert. We all sat down to eat it and Vera sweetly said, “It looks like poop, but it doesn’t smell like poop” then she took a bite and said it was delicious. Thank goodness everyone laughed. I almost had a heart attack. Our rule is, try it and you most likely will like it. And they most likely do every time. I know this doesn’t work for every child–a lot of my friends have kids who will barley eat anything. Fortunately, as we get older, our taste in food changes. I used to hate onions; now I don’t mind them at all. Sometimes it just takes a little time and growing up to start liking different foods. In the mean time just try and be polite even if you don’t like what’s on the table. I read an article on livestrong that you and your child can have an unspoken signal to get your attention. For example, tell your child to place her hand on your knee or arm to indicate she has something to say. When you feel her hand on your leg you will know she has something to tell you, but she must wait her turn. You can then squeeze her hand to tell her that you know she is waiting. Praise your child for not interrupting. I wish I would have thought of this years ago. I know with younger children this couldn’t work but for 4-9 year old kids, it can save a you a lot of consternation. Start them young with this one. It’s nice to have help after you cooked all afternoon. I love it when they clear the whole table for me and load the dishwasher. That really makes my night. Whenever I see a mother with a stroller I try to beat her to the door to help her. Just last week I saw a teenager do this for a stranger. It made me so happy that I told him he was so nice. It put a big smile on his face. If my girls are invited to play at a friends house I try to always send a healthy snack that they can share with everyone and tell them not to raid the kitchen. If they get hungry they need to ask the parent in charge if they can have a treat. My daughter is also allergic to all nuts so I always try and send a lunch with her so parents don’t have to worry about what to feed her. Teach your kids to do kind things and not expect to get anything in return. I was sick about a month ago and my daughter made me herbal peppermint tea, soggy cereal, and a little note to make me feel better. It really made me feel special. As a parent, I know that if I treat my children with love and respect, they will do the same in return and the manners will follow. This is more of a fun activity for your kids. My girls had a great time coloring the place mat and setting the table correctly. All you need is a rectangle poster board and crayons. You can even use plastic utensils and paper plates. Color and then place the items where they belong. Nobody is perfect, so don’t stress about teaching your kids all these manners in a week. Maybe try one a week or one a month. What ever you know works best for you and your child. Every child is so different. The most important thing that I have learned is to have fun with it and make sure your child knows you love them no MANNER what. 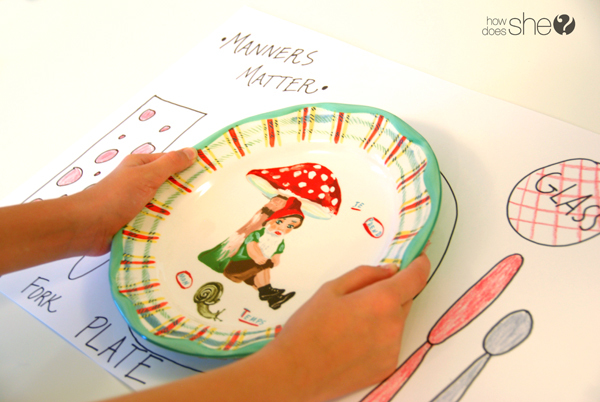 What manners matter to you and your children? I don’t have kids so I can’t comment on how easy/difficult it is to get kids to do these things, but I am SO grateful my parents instilled these manners in me as a child! I know they served me very well in life. thanks for the great tips! i’m going to use the signal for interuppting. I would add yes mam/sir too, it isn’t just a southern thing, but a respect thing. Great list. My kids are older and are pretty good with these skills. My issue is that because they are shy, they aren’t very good about talking to adults; things like eye contact, answering loudly enough, greetings, using the adult’s name, etc. Any suggestions to help with these skills? Encouraging your kids to learn one new thing about each person you meet with them can create an urgency in them to communicate properly. You may need to create a reward system to jump start this habit, but it will pay dividends in the work place and life later. Such great advice – thank you! I completely agree that manners and politeness in children are so important, and just as important for adults. I was relieved that for the most part, my daughter has these manners down. But I love the ideas of the placemat and the hand signal for interrupting. Thanks for sharing. I love the idea of a signal for when a child wants to interrupt a conversation. This will be very helpful. Your girls are beautiful. Thank you for the tips on teaching good manners to children. sigh, these are great but my youngest is 24 😉 I can say they both do most of these. I remember as a child being expected to do all of these. I also remember the good feelings I had when I used my manners. This is such a wonderful reminder and great ideas to teach my kids how to be polite. Love this! There was a large family that went to the same church as me and my family. I have six children, but they had more. All of their children sat so quietly and showed such great respect to the parents and to the speakers. I do know that manners count and we can teach our children respect and courtesy. Thanks for a great post. Unfortunately, this is becoming a lost art! This is the best post!!! Such great advice! I think manners are so important for kids to learn at a young age. I loved everything you pointed out in your top 10 list. When my kids have friends over one of the first things I look at is if their friends have good manners., and that helps determine whether there are future play dates or not. I ❤️ this! I appreciate the helpful tips and advise. We will defiantly be trying this at our house. Love this post Ashley! Such good reminders. Also I need to make the table placemats. My kids always set the table but never do it right, so these would be awesome!! Love this post! I totally agree with teaching kids manners. I love the idea of how a child can interrupt a conversation. Your girls are so cute! I also think table manners are important … One of my biggest pet peeve is when kids chew with there mouth open. Love your 10 Manners post.. My DIL taught her kids to take a bite of everything and if they didn’t want any more they said No Thank You…so it is called a “No Thank You Bite.” They like about half the things they try. The I=Interrupting Signal is brilliant. I love the no interrupting idea! Where, oh, where did you get the gnome plates??? My husband is obsessed. Must have! So true!!! That is a great one. Thank u. This is a very good list. It made me smile when I read that your kids burp and toot. We use the toot work too. Thanks. Ha ha. Thanks for your comment. Loved this list of manners. It’s such a responsibility to bring up respectful boys for our future generations. I like the idea to have a signal to get your kids to wait to tell you something. I’m definitely going to start using that one from now on. Thank you for sharing. I am a grandmother of just one granddaughter (4) and it has been a challenge to repete yes mam,and no mam and so on.. will try to find that book , Excuse Me! Thanks for for info , keep up the good work . Love it!! Thanks for idea. One more item would be to not tell someone they are fat, too skinny, or anything else that may be hurtful. I have had this happen and the parent just sat there smiling. Thanks for the post! Manners are important. The one I would probably add is chew with your mouth closed which would also include not talking with your mouth full. I agree!! I remind my kids to chew with their mouth closed a lot:( thanks for your comment. There’s one reminder that I give to my daughter over and over: “We are sharing this space.” She is seven years old, so she has a tendency to be messy (crayons and paper ALL OVER the table at the restaurant!) and loud (because of course) and she doesn’t quite “get” things like sharing walls and floors or watching where she’s going. Great advice. I really love this. Thank you. My kids are 22 and 24 and I have been told all their lives they are very polite and respectful. We also taught our kids to say Ma’am or Sir and to address an adult by their last name unless they are give permission by the adult then they address them as Miss/Mr. Sue, Bob, etc. We also taught them to be helpful to the elderly or anyone in need. My son has carried grocery bags or pushed carts for many elderly folks or pregnant ladies.. Nothing makes me more happy when people serve others. You raised good children:) thanks for your comment. I recently read the same article regarding interrupting and started doing the same thing with my 5 year old, though we’re only a few days into it, so no results yet. While he knows to say excuse me when needing attention, it can become very repetitive and loud , which I find just as rude. Yes to opening doors! I have taught my son that since he was 3 years old! I’ve had teenagers, seniors, ladies, and men comment on how great it is that he does that. Also teaching them how to order food nicely, pay for things (I give my son the money to hand to the cashier), wait for change, and say thank you. Responding with a “Thank you, you too” when someone says have a nice day, using “your welcome when someone else thanks them,. Taking turns, and some times letting others go before us (this was a hard one for my son because he loves to be first). Manners are definitely a lost art form in today’s society, so Love this list! Great advice on taking turns. My kids love to be first too. I need to work on this with them. Thanks for your comment. Great list. Just tonight I found myself requesting that my 3.75 year old ask to be excused before leaving the table. I remember my parents having us do that and kind of feeling that it was unnecessarily formal and oppressive at the time, haha. But when she abruptly bolted from the table this evening I *got it*. It felt disruptive and inconsiderate. I hadn’t realized that up to this point she had been announcing that she was finished or full and we would ask her to carry her plate to the kitchen. This rush to go play was new and so it seems we have a new manner added to our list. Thank you. In today’s day it is good to have reminders and see that respect for others is still important. My kids are still at home and still needing a brush up on manners here and there! And it’s great to have some fresh ideas on instilling them! We started using the no interruption trick when my daughter was almost 3 and she took to it very quickly. We first heard about it in Dani Johnson’s Grooming the next Generation for Success. Great post – I like my parents rule for food – you never say “eww” “I hate that” “no I dont want that” you say ‘Its not my favourite”. Honestly, it was drilled into me so much as a child I still say it – I was a picky eater with sensory issues that would gag and throw up with a lot of foods, so this was a big issue for me. I want that “excuse me” book – put it on my amazon shopping list !! I am pretty surprised you did not mention written thank you note for receiving a gift. I was raised to do this and I raised my children to do this. I now have 15 grandchildren and many of them live out of state. I take the time and expense to send them gifts for their birthday etc. I often have to ask the parents privately in a FB mssg if my grandchild ever received the girt! In this day and age when communication is so easy I would gladly accept a phone call or email in lieu of a written note but nothing is really bad manners. Do you agree? I love these! My kids are 1,3 and5. I am working on some of these and really like the last one! (We haven’t tried it with all the pieces). I also love the Excuse Me one. I have taught my kids that from the time they could talk. They say excuse me and put their hand on my knee. My 5 yr old gets it and my 3 yr old says it often, but keeps repeating until I answer. It’s a work in progress but SO worth it. I would add, saying “Pardon? or Pardon me?” when they don’t hear you. I hate hearing kids say, “huh?” or “what?” My 4yo says pardon me and we get tons of comments on how polite he is when we’re in public. It surprises me how amazed people are! Manners do matter, too many people forget that when they’re just trying to get their children to behave lol. When going to my friends house to visit, her 2 kids were eager to talk to me as well and had a habit of interrupting. Solved it by giving them the first 15 min to talk, show me their projects, treasures, etc. They were then “banned” to the other room and we could share a cup of tea in peace. Later we all regrouped, but it worked well. About 15 years ago I took my 3 young nieces (6, 8 & 10) on a vacation to Copper Harbor, MI. Stopped at a gift shop, made my purchases and walked out to put them in the car while Johanna was purchasing some post cards. Minutes later 3 girls burst out of the shop showing me their treasures. The shop owner was a retired school teacher and said she noticed how well behaved they were and believed in rewarding good behavior. She had collected a bag of goodies (about $12 retail) of treasures like polished agates, copper, a pen with a lake freighter that “floated”, magnet) and gifted it to them. Made a HUGE impression on them and we still talk of it. Just 2 weeks ago I was in Copper Harbor again, stopped at the shop and the same lady was there, now 81 years old. She was so happy when I related the story and the impression it made on 3 girls. In turn I have tried to unexpectedly reward good behavior as well. I ask my grandchildren to acknowledge others . Example: when elders say hello I would like them to say hello back or to wave. Great post! I have two daughters of my own (now grown) and also did home child care for 15 years when they were growing up. We had a lot of opportunities to teach and practice manners. I liked being able to take 6-12 kids to the grocery store or out to eat while on a field trip. Sure, kids are kids, but they understand expectations. If you set the bar high or low, they will reach it. Kids are SMART. It’s best to give them some credit and make them feel confident. Manners are important however not easy for all children. My DD8 has Selective Mutism. The anxiety she feels going to school, in unfamiliar situations or speaking to most adults makes her incapable of speech along with a host of other anxiety symptoms like stomach aches, inability to make eye contact, hiding her face, expressionless face, etc. Check out the free animated book, song, poster and lesson Howard B. Wigglebottom and Manners Matters at http://www.wedolisten.org click on parents and manners. Just stumbled upon your post in Pinterest and loved reading it! Can’t agree anymore with you about manners, if we teach our kids when they are young, they will grow up and all these manners will come naturally to them. I will start using the interruption tip!, My almost four years old can drive me crazy with the mom mom mom!…. I teach 4 and 5 year old Preschool. I recently learned the waiting patiently to speak and not interrupt manner which has been wonderful for my sanity. Another manner that I try to teach my students is related to sharing. When they come to me to complain about wanting to play with a toy that someone else is playing with, I share a special phrase with them. I ask them to nicely say to their friend “when you are finished playing with that (toy name) may I play with it?” And I teach the other child that they don’t have to give up the toy but they must reply “yes”. The other child usually becomes uninterested in the toy quickly and shares it with their friend. I never put myself in the middle of sharing battles unless someone has actually snatched a toy away from a friend. Then I intervene to share- this is not the way we share toys by taking them from each other. This has been another sanity saver in my classroom. Love those great suggestions! Thank you for sharing! You might like my 3 manners books for young children: The Magic Word, Gimme-Jimmy, and Manner-Man. Thank you for your post these are rules that parents must teach to their children. Good behavior is getting lost because we all accept our kid’s bad behavior and sometimes get mad at them when they missbehave but actually we must have more COMMUNICATION with our kids and establish rules. Great list and I agree with all of it! Except for that comment about tooting and burping described as a “problem”. To me that is a sign kids are healthy! Of course it is nice to say “excuse me” when it slips out ;). I think saying something negative about our human nature is sending the wrong message to our kids. My mother was raised with all kind of negative messages about those things and as she got older she experienced health issues just from not being able to “let it out” even if she wanted to. So we just need to be aware of the message out kids are getting. I’m a grandmother at age of 45; my husband is a little bit older than I am, his oldest daughter has blessed us with three gorgeous grandbabies. We also have three children, college freshman age and older. Grown kids have given me a much different perspective than when they were younger. You have the best-of-the best on your list! • Once when your child is grown and seriously dating, looking for a husband or wife. Re-read the list. How would your heart feel about guiding/mentoring/blessing your child’s journey with someone who can’t or won’t participate in the things on this list? Is your son or daughter prepared accordingly? • Once more when your child has a child. Allow them to share the list with their husband or wife, trusting them to make decisions as parents and ask for advice from your wealth of wisdom when they’d like it. P.S. #1 is my all-time favorite! ? All good manners to have. One of the manners that i think is most important is not talking when your mouth is full and chewing with your mouth closed. THANK YOU! Every parent should read this! All above plus as well as the four opening, wait for others to pass/ step aside to let others pass sometimes. It’s not a race to get the supermarket aisle behind you. You know, when someone is going in a different direction to you. Let the past. Where can I find a printable copy of this? I was taught one thing when I was a child that I believe is extremely essential. I am now 22 and I still use it every time that I am at anyones house because you can see how grateful the hosts are when you ask. It really is just the polite thing to do. Any time I would leave to go to a friends house my mom would say, “Don’t forget to ask, Can I help you with that?”. Basically it means that if you are at someones house, say they are making dinner, cleaning up, doing anything really (especially if it is for you) to ask them if you can help with whatever they are doing as a small thank you for have you. BEST PART, when I started dating my now boyfriend of 3 years, I did this with his parents and I think they almost adopted me right then and there. His parents and I have a great relationship now and I feel that it’s all because I was taught how to be respectful and grateful when I’m in someone else home. And for one last thing that I still use today (along with please and thank you), my mother always taught me was to say “thank you for having me” whenever I got picked up or it was time to leave. You were taught well! Thanks for sharing those great ideas! I went over this blog with my two children. It was a great lesson for the day. Printing this out and going to try & help my Sis in Law with my nieces. I love them too much to let them continue on the way they are right now. LOL – thank you for the helpful guide to follow.